They tracked down and were able to restore Laurietta’s original fanlights, banister, a porch column, and a couple of its mantels that had been removed over the years. I’d love to see more of this kitchen. The cabinets are painted Benjamin Moore’s Gentle Cream. The island was repurposed from cypress wood found elsewhere in the house. Their dog Buck looks right at home in here, doesn’t he? The couple transformed Laurietta “from a dilapidated buzzard’s nest into a roost where their extended family could come together for weekends and holidays.” Visit Country Living to read the story by Beth Ann Fennelly and photos by Bjorn Wallander. 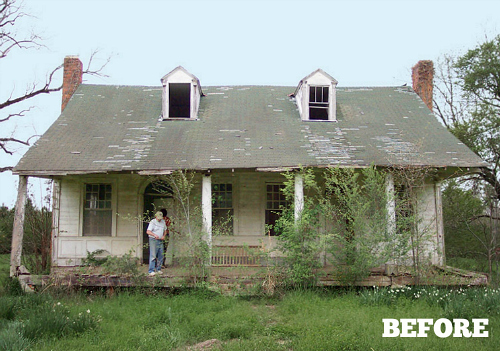 It’s always heartening to see a house like this restored and loved again, don’t you think? That is one very adorable family photo! Meanwhile, I am mad for the kitchen cabinet hardware they chose! And I definitely have a ‘thing’ for hanging ironstone plates; I love the way they incorporated framed artwork with their plates. Genius! I’m swooning over that kitchen island! I’m in love. Perfect. Beautiful. Inspires me! 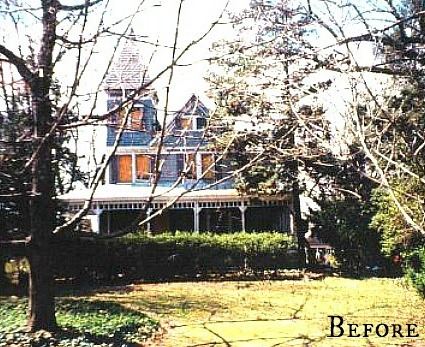 With some before and afters, you can barely see anything of the original home in the finished product. But this transformation is so special because you can still see the lovely details that were always there…those amazing doors on the facade, the full front porch, the twin chimneys. It’s stunning! 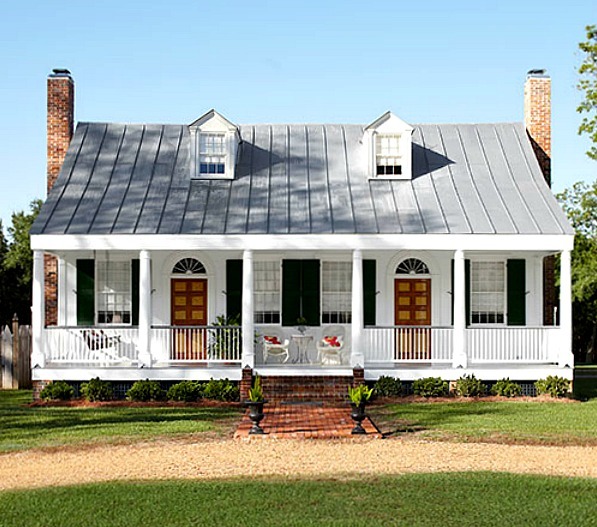 Some of my favorite details…the metal roof (love it), the classic white with brick and green shutters, and the amazing decor that perfectly suits the house. What a beauty! Wow. They did an amazing job. You can tell there was a lot of love and care in that restoration. Like others have said, this is a fantastic renovation, staying true to the style of the original house. It looks amazing and they look like a very happy family standing and sitting on the porch. My grandparents had red brick steps just like the ones here on their farm house. Oh my, it’s gorgeous! And to think, planking on the walls and ceilings is one of the newish “it” decorating ideas–but this old house? It makes the newish stuff look like child’s play, in a good way. 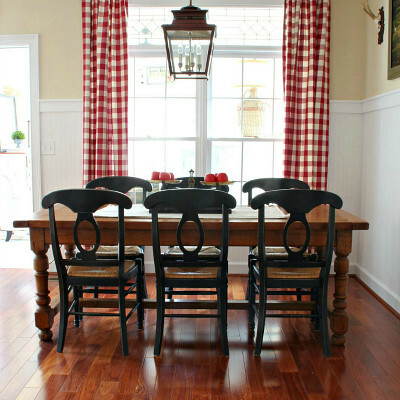 Loved every single thing about the restoration of this home…perfection! Wow! They did an amazing job restoring this house. It looks great and I love everything about it. The house (pre-restoration) reminds me of one in the movie “Big Fish.” It was the rundown house that Helen Bonham Carter’s character lived in. I love it, would not change a thing! Keys please. I’ve seen pictures of lots of homes that were brought back to life but this one has to be my all time favorite! It’s just beautiful! Awesome! Now one can see how a plantation house would’ve looked in 1820. I sure admire homebuyers who restore as much as possible..they have to have a live of history and the strong will to see it through. Great job! But Buck steals my heart! Good grief, what a transformation! They did an excellent job. Did they say how much it cost to do? They didn’t give numbers, but they had to be significant! Great reinstallation! New living room is amazing. I love the technique they incorporated framed artwork with their plates. Smarts! Good job. The metal roof with all the seams just ruins it. That’s all you see. Shake (or shake-like) would have been much more in character and better preserved the look of the original house.